I never want to see another picture of ________.” Industry veterans share their pet peeves on themes in contemporary photography. In this series they present their “rule” along with five photographs that break the rule in an effort to show that great work is the exception to the rule. I never want to see another street photograph. Especially one of New York. Yes, street photography captures an ever-changing spectacle, with new fashion trends and hairdos. But human behavior and emotion, which are at the core of street images, remain stubbornly consistent. After decades of looking at people traversing the streets of New York in person and in photographs, what is there left to surprise me? Apparently, plenty when New York’s streets and their denizens are seen through the lens of Jeff Mermelstein. His images caught my eye, my heart, and my funnybone when I came across them on Instagram. Street photography usually invokes the thrill of voyeurism, allowing us to see without being seen. Occasionally, there is a glance or grimace of recognition of the camera’s presence, but the physical distance and the brevity of the chance meeting usually remove the photographer and viewer from harm and intimacy. Not so in Mermelstein’s daring photographs. They often appear to be photographed from such a short distance that a collision may follow the snap of the shutter. This is photography as a contact sport. The Everybody Street documentary on YouTube shows the photographer darting in and around the human traffic, as light and fast on his feet as a boxer. Many of Mermelstein’s images are more portraits, albeit it involuntary ones, than street photographs. His subjects demonstrate an emotional intensity that reverberates within his tight framing of them, ramping up the energy and power of the encounter. He respects and features the pedestrians’ individuality. He also has a great sense of humor and manages to capture people doing the quirkiest things. Or, he composes the oddest groupings of fragments of flesh, clothing, object, and background. The resulting image at first seems alien, illegible, and impossible, then dissolves into a physical reality that yes, we’ve even seen ourselves, but never from this viewpoint or with this wry wit. 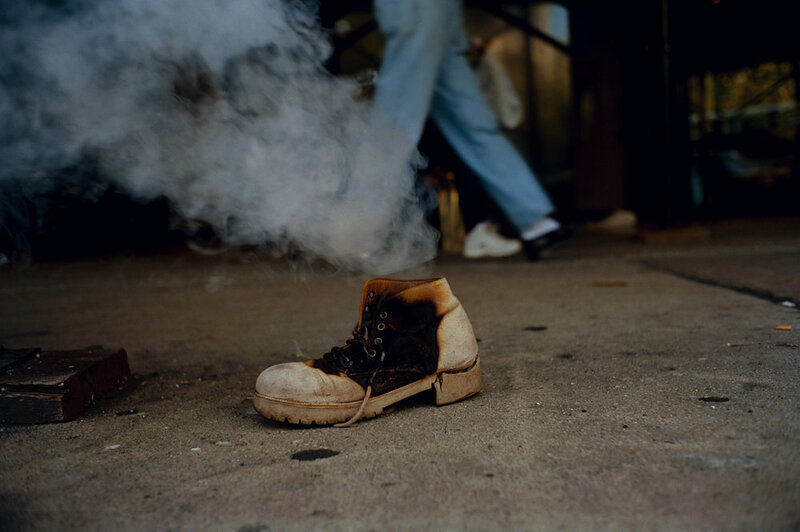 Mermelstein brings to his images a unique sensibility and vision that makes even a familiar world like the streets of New York new again.